U.S., British and French forces hammered Syria with air strikes early Saturday Syria time in response to a poison gas attack that killed dozens of people last week, in the biggest intervention by Western powers in Syria’s civil war. U.S. President Donald Trump announced the military action from the White House late on Friday. As he spoke, explosions rocked Damascus. Trump said he was prepared to sustain the response until the government of Syrian President Bashar al-Assad stopped its use of chemical weapons. The intervention was the biggest strike by Western powers against Assad in the country’s seven-year-old civil war and pitted the United States and its allies against Russia, which itself intervened in the war in 2015 to back Assad. 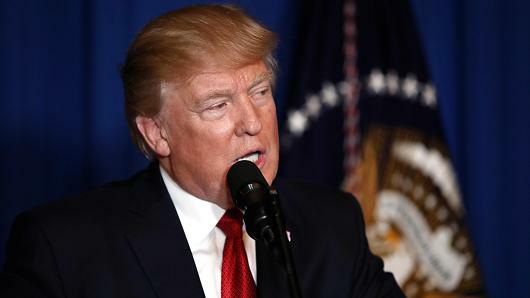 “A short time ago, I ordered the United States Armed Forces to launch precision strikes on targets associated with the chemical weapons capabilities of Syrian dictator Bashar al-Assad,” Trump said in a televised address from the White House. A U.S. official told Reuters the strikes were aimed at multiple targets and involved Tomahawk cruise missiles. At least six loud explosions were heard in Damascus in the early hours of Saturday and smoke was seen rising over the Syrian capital, a Reuters witness said. A second witness said the Barzah district of Damascus had been hit in the strikes. Barzah is the location of a major Syrian scientific research center. “The purpose of our actions tonight is to establish a strong deterrent against the production, spread and use of chemical weapons,” Trump said. The U.S. president had sharply critical words for both Russia and Iran, which have backed Assad’s government. “To Iran and to Russia, I ask, what kind of a nation wants to be associated with the mass murder of innocent men, women and children?” Trump said. British Prime Minister Theresa May said she had authorized British armed forces “to conduct co-ordinated and targeted strikes to degrade the Syrian regime’s chemical weapons capability.” She described it as a “limited and targeted strike” aimed at minimizing civilian casualties. The military action is not about intervening in Syria’s civil war or changing its government, she said. The Syrian Observatory for Human Rights said a scientific research center and military bases in Damascus were struck in an attack by the United States, France and Britain on Saturday. The Syrian army’s Republican Guard and 4th Division, elite units of the Syrian military, were struck in the attack. Syrian air defenses shot down 13 missiles fired in a U.S.-led attack on the country on Saturday, Syrian state TV said. It said the missiles had been shot down in the Kiswah area south of Damascus, the capital. The Syrian Observatory for Human Rights said a total of three scientific research centers had been hit in the attacks – two in Damascus and one in the Homs area – in addition to military bases in Damascus. The Observatory said all the bases and facilities struck in the attack had been evacuated by the Syrian government earlier this week. SYRIAN president Bashar al-Assad has reportedly been hiding his warplanes within Russia’s bases to save them from being obliterated by the US missile blitz. But after Donald Trump made it very loud and clear on Wednesday that his military was about to attack in a bombastic tweet, the regime has had plenty of time to prepare for the strikes. Trump’s tweet read: “Russia vows to shoot down any and all missiles fired at Syria. Defense Secretary Jim Mattis says he is “absolutely confident” that Syrian President Bashar Assad is behind the alleged chemical attack on his people that the U.S. and allies retaliated against Friday night. Congressional leaders are supporting President Donald Trump’s decision to launch airstrikes against Syrian President Bashar Assad in retaliation for an apparent chemical attack against civilians — although there are some reservations. A highly placed Russian politician is likening President Donald Trump to Adolf Hitler after the launch of airstrikes against Syria, and says he regards the action as a move against Russia. That’s according to state news agency RIA-Novosti. The Nazi forces’ opening attack against the USSR in 1941 was launched around 4 a.m. They were starting to compare Trump to Obama’s “red lines”. Trump proved them wrong. https://uploads.disquscdn.com/images/a10c779a21e259d3e37d9738f046c6efeda5fcdf324dc6783c442e755a3851ba.jpg Syrian air defenses shot down 13 missiles…. Bashar al-Assad has reportedly been hiding his warplanes within Russia’s bases with the hope that the unthinkable will happen. Did he saved them from being obliterated by the US missile blitz? None of the missiles that were launched by the US and its allies entered Russian air defense zones that protect facilities in Tartus and Khmeimim, the Russian Defense Ministry said. Why should the missiles enter Russian air defense zones? It is Assad regime that is targeted not Russia. Russian President Vladimir Putin told his Iranian counterpart Hassan Rouhani Sunday that further Western missile strikes on Syria would lead to chaos in international relations, Russian news agencies cited the Kremlin as saying. In other words Putin is doubtful that Assad understood the massage given by France and Britain when they launched missile strikes on the country over a suspected poison gas attack. 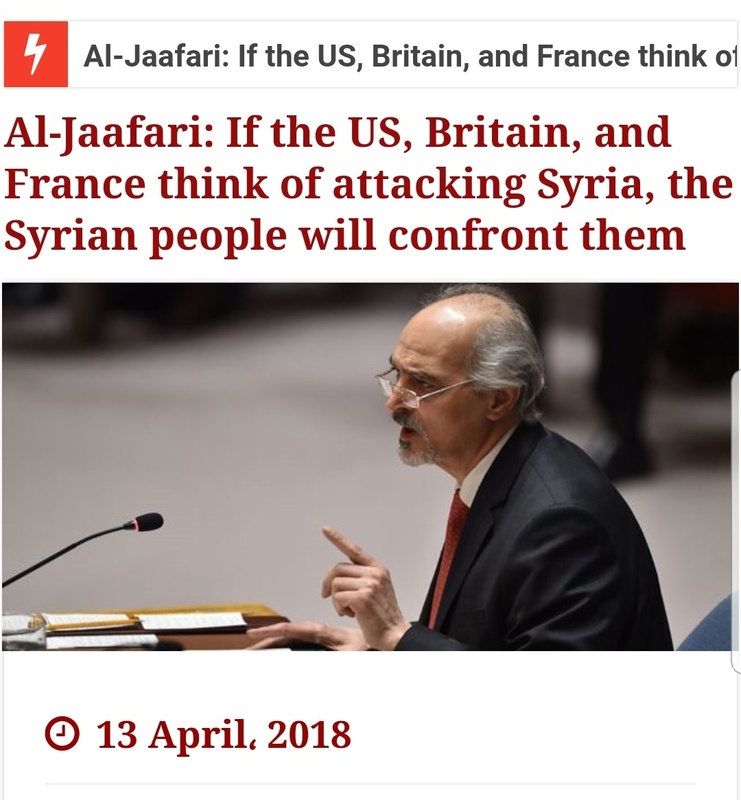 I am pretty sure Assad/Iran do not understand this and will be as defiant as ever. As long as there is one of them left they can still declare victory over their pile of rubble.